Fez is one of the imperial cities in Morocco and it's one of the country's most visited destinations. It has a very historical and traditional medina that is well worth a visit. It is ideal to stay within the medina as this is where you will spend most of your time. The new town is modern and less interesting, and is a good distance from the medina. Accommodation in Fez is reasonably priced and you likely won't have trouble finding an affordable guesthouse, riad, or hostel. Because the buildings are so old, most accommodation can be smaller and more cramped than you may be used to. How much do hostels in Fez cost? A good options for solo travellers, couples, and small groups. Riad Verus is a popular riad style accommodation in Fez. It's affordable and centrally located within the Medina walls. It's about a five minute walk from the famous Batha Fountain and is about ten minutes from the Bab Beujeloud Blue Gate. Although it's within the medina, a taxi can still get within about a three minute walk from the hostel. This is a fun place to stay with a lot of amenities for guests. They have a restaurant that serves drinks, pizzas, and a variety of Moroccan dishes. 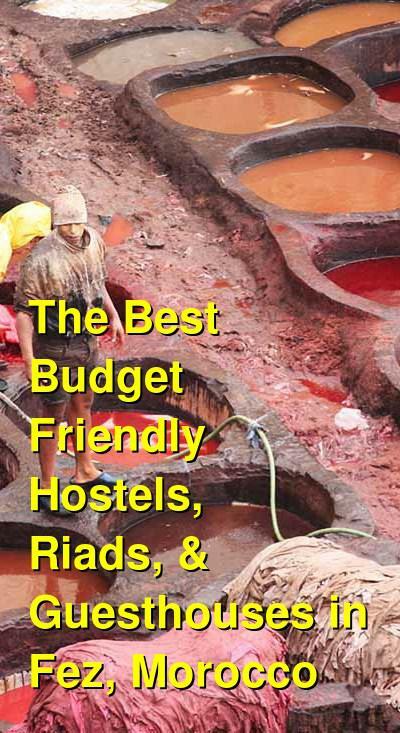 The riad is also quite affordable and is perfect for budget travelers who want a good location at a reasonable price. The hostel can also help you coordinate any number of activities including camel treks to the Sahara, henna painting, Arabic classes, drum sessions, and cooking classes. There are a range of room types available. There's a five person room on the patio level that has a fridge and television. There are also twin rooms and double rooms with both shared or private bathrooms. There's also an eleven person dorm with a balcony and a five person dorm that's a little smaller. This is a popular and fun place to stay where you're sure to meet a diverse crowd of international travelers. A good option for solo travellers, couples, and small groups. Another centrally located hostel in Fez, Dar Rabha has a variety of room types available. Guests can choose from dorms, family rooms, and suites that range in size. Dorms sleep four, six, or eight people. This guesthouse has a nice rooftop "tent" where you can take in the sounds of the city. It's the perfect place to sip mint tea and chat with other guests. The staff is helpful and can help you arrange any number of tours. They can also help you arrange cooking classes or a visit to a hammam (a Moroccan spa). Breakfast is served every morning and there is free wi-fi throughout the building. Dar Kenza is a family run guesthouse in Fez. It's located in the city's medina, but is still accessible by car. This is convenient when you arrive by taxi. 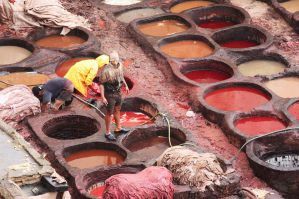 It's also just a short walk from interesting souks and the famous Blue Gate of Fez. It makes a nice base for exploring the area. The guesthouse has a nice rooftop terrace where you can enjoy views of the medina. You can eat your breakfast on the terrace every morning and listen to the city wake up. It's also a nice place to view the sunset. The guesthouse has some unique amenities including a self-catering kitchen, televisions in every room, free wi-fi, and a restaurant on-site that serves traditional Moroccan food. There are double, three bed, and four bed rooms available, each with private bathrooms attached. Hostel Dar Jannat is about a five minute walk from Bab Boujloud (the Blue Gate), and the main entrance to the medina. It's between the main street of Talaa Sghira and Talaa Akbira. The hostel is surrounded by many souks, shops, restaurants, and anything else you might need. There's a rooftop terrace that lets you view the surrounding scenery and a friendly environment where it's easy to meet other guests. Whether you're traveling alone, as a couple, or with a small group of friends, this is a great place that is convenient to everything and still very affordable. They can also help you arrange any tours or activities that you might want to try out. Both private rooms and dorms are available. Private rooms include doubles, and three bed rooms. Dorms sleep up to six people.